The only real rule of orchid growing is that the rules are just guidelines. Winter was brief and many different orchids are both blooming earlier and initiating growth early relative to most years. Orchids that rely on day length instead of temperature for blooming are following their normal blooming and growth pattern. Readers of this column know my normal advice is to limit fertilizer applications to warmer months, but this year is different because the environment where my orchids are growing has been different. My orchids that rely on temperature to start are in a different growth stage than those that rely on day length. How do I know that some have started their growth cycle and others not? Should fertilizing applications begin if some orchids are growing and others are not? There are many hanging orchids in my greenhouse, not just because of space, but because they are some of the “canaries” that tell me how my orchids are interpreting light levels and temperatures. Especially important in my greenhouse are bifoliate cattleyas, such as C leopoldii and C guttata. When these species initiate their new growth, spring is officially here no matter what the calendar says and they are getting close to initiating new growths. Many of my spring blooming cattleyas and paphs are orchids that use temperature to tell them when to grow and flower. Unfortunately, this year these will be finished flowering when the spring orchid shows need exhibition plants. Many of these have almost always bloomed within a week or so of the same time each year, but this year will be an exception based on buds I see swelling in the sheaths. When orchids initiate new growths, it is time to begin using fertilizer regularly and at higher doses. After several months of flushing during the fall and winter, nutrients adhering to media have largely been lost or used up. During the last several years, I have limited fertilizers in an attempt to avoid producing lush foliage that can be attacked by bacteria and fungi. 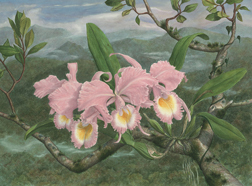 There are some orchids that do receive regular fertilizer, albeit at lower levels in winter. Those include orchids that are growing and blooming such as phals and paphs, which I keep in different places. Many cymbidium growers follow a similar fertilizer regimen, but use fertilizer higher in phosphorus, the middle number, starting in fall. Hobbyists with just a few plants have an easier time making the decision because they can look at each plant and decide to fertilize or not. This is really easy if Nutricote, which lasts six months, is your fertilizer of choice. The balanced formulation is an excellent one for all orchids and safe to use. I usually add it to the surface of the medium in early March, but recommend adding it now if your orchids are starting to grow new leaves or breaking eyes for new pseudobulbs. If you cannot find Nutricote in your local store, check with Carter & Holmes Orchids. They sell small quantities. If your temperatures have not been as warm as here in north Florida, you might need to wait a little longer. Let your orchids tell you when you need to begin adding fertilizer. It will be interesting to see if there will be extra bulbs or leaves this year with a longer growing season.